The trees on the right are in a square of grass and trees that's an old churchyard - a visitor to the web site tells me that it was cemetary of St Mary de Castro. 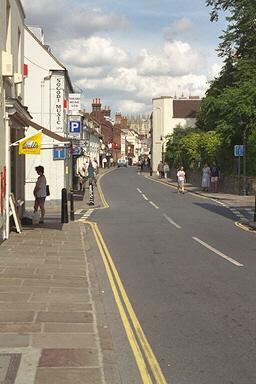 The white building on the left is Socodi Music, they moved here from the Friars in June 1996. Turn left here for Rosemary Lane and right for Castle Row. This page last changed on 18th November 2018. Photograph June 1996. © Copyright Peter Collinson, All rights reserved.